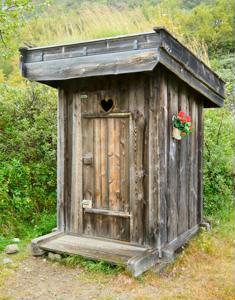 While toilet theft is by no means unheard of, one Canadian victim of a heartless criminal has taken to the internet and offered $500 to anyone who facilitates the safe return of an outhouse he built himself. The outdoor lavatory, along with a picnic table, was pilfered from his farm last month, according to the Edmonton Journal. While the picnic table was not homemade, the outhouse took 50-year-old Randy Nemirsky four days to build. The news source reports that his ad on the eBay subsidiary Kijiji has been viewed nearly 1,500 times, yet Nemirsky has not received any word yet regarding the whereabouts of his toilet. “You don’t steal a toilet. You maybe tip it over on Halloween, but why would you steal a man’s toilet?” Nemirsky told the news source. "It was so unique to have it there." The outhouse was closed off with an 80-year-old door from Nemirsky's mother's basement, and was otherwise constructed with plywood and two-by-fours. At 8 feet tall and weighing, Nemirsky guesses, between 800 and 1,000 pounds, the outhouse was used often during pit stops on mid-afternoon trips with his all-terrain vehicle, he told the Edmonton Journal. On a lighter note, The Huffington Post put together a list of the top 25 strangest toilet seat covers it could find. Some feature terrifying depictions of snakes and monsters - the last kinds of things most people would want to see when preparing to relieve themselves. Other seat covers are meant to be homages to vintage culture like pinups, King Kong and Elvis Presley. It seems there's a toilet seat cover that caters to every imaginable taste in aesthetics. Some toilet seat covers designed for children depict Sesame Street characters, the kids from High School Musical or SpongeBob SquarePants and his pal Patrick Star. Others are geared toward animal lovers and show dogs, cats, seals and turtles, as well as one nature scene of wolves running through the snow. Possibly the most amusing on The Huffington Post's list of strange toilet seat covers is a cartoon Army drill sergeant shouting "Private! I said put down that lid!"